This beautiful smiling face is Joan Hallford, a Taste of Home Field Editor for the popular magazine. 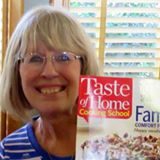 Joan’s Facebook page is filled with delicious recipes that have been submitted for publication from cooks across the country. Joan sent a box of books to help rebuild The Culinary Cellar, as have many other generous and big-hearted Field Editors. I love my Taste of Home readers! And on a fun note, Joan once had cousins who lived in my hometown. Look at the books Joan sent! 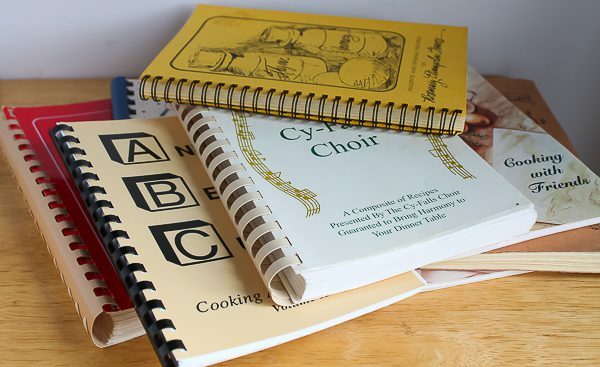 I love community, school, and church cookbooks! 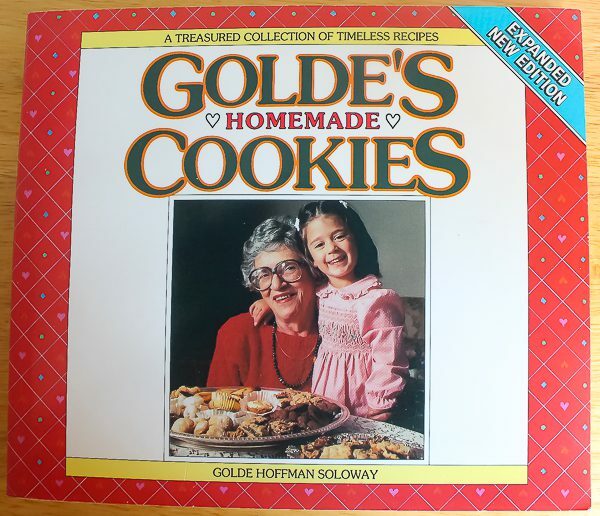 I almost made a cake from Charleston Cake Lady book, but it so happened I had two bags of macadamia nuts waiting to be used and I went with Golde’s Homemade Cookies and her macadamia bars. I’ll get back to the cake lady at a later date. How could I resist cookies from a grandma and her adorable granddaughter? The bars used almost a pound of macadamia nuts. They are buttery and ooey-gooey! Every bite contains a mouthful of nuts. 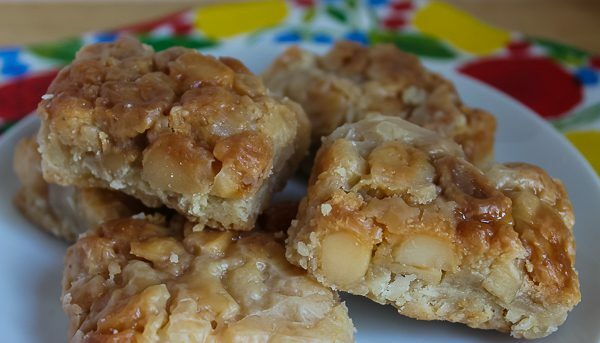 If you love macadamia nuts, these bars are for you! Remember not to chop them finely, you want a coarse chop that will give the bars a better look and texture. Here is my advice on making the cookies: line the jelly roll pan with nonstick foil firmly on the bottom and up the sides. The bars tend to get sticky on the sides and can make a mess of your nice pan. I learned this the hard way! Also, they are better the next day after giving the bars time to develop the flavors and texture and will be easier to cut. After cooling completely, cover the pan tightly with plastic wrap and let sit overnight at room temperature. 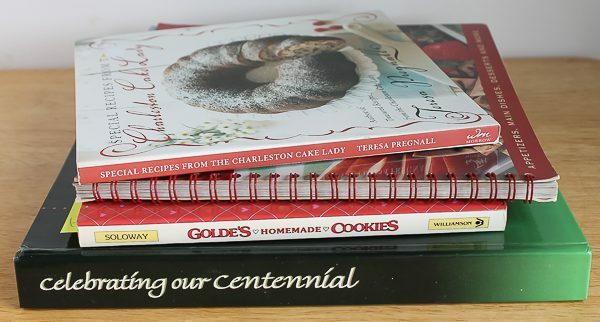 For the avid cookie baker, you will find recipes in the book for bar, drop, easy, festive, and Golde’s specialty cookies. There is something for every cookie monster in your family. Thank you, Joan, for all the books and your generosity! I will treasure and take care of your books in The Culinary Cellar. For crust: In a large bowl mix flour and sugar together. Using a pastry blender, cut in butter until mixture resembles coarse crumbs. Add water and vanilla, and mix until a ball forms. On a lightly floured work surface, roll dough out to 8-by-13 inches. Press dough on bottom and up sides of a jelly roll pan (10-by15-inches). Refrigerate pan at least 30 minutes. (Note: I recommend lining the pan with nonstick foil, pressing smoothly and up the sides. The edges get sticky). When ready to bake, heat oven to 400 degrees. Bake the refrigerated crust for 10 minutes. Lower oven temperature to 350 degrees. Set crust on wire rack while preparing filling. For filling: In a saucepan, place cream, rum, sugar, and salt. Bring to a boil over medium-high heat, stirring constantly. Reduce heat slightly and boil for 10 minutes, stirring constantly. Add macadamia nuts and cook 5 minutes more. Remove from heat and stir in vanilla until combined. Pour nut filling onto partially baked crust. Bake for 45-50 minutes or until the top is a nice golden brown and edges are bubbly. Remove to wire rack to cool completely. I found that the bars are easier to cut and have developed more flavor if you let the pan sit at least 8 hours or overnight, covered with plastic wrap. Cut into bars to serve.